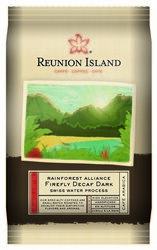 Reunion Island Firefly Decaf (Medium Roast). An exceptional, single origin coffee from a progressive, Rainforest Alliance Certified producer, with character to maintain it exceptional taste and aroma through the Swiss Water Process decaffeination. A medium roast coffee with a buttery body and the flavors of carmelized sugar and dark chocolate. Each case has 24 bags of 2 oz coffee. Each case contains 24 bags of 2 oz decaf coffee. Please let us know what you need or think!